There was a little intrigue surrounding the decision, but it's finally been made. 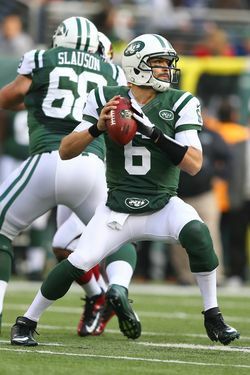 Despite Greg McElroy's superior performance on Sunday, and despite word that GM Woody Johnson prefers McElroy to Mark Sanchez, Rex Ryan has decided to give Sanchez the start this Sunday against the Jaguars. In a press conference this morning, Ryan admitted that he had to take time to think things over and solicit different opinions from within the organization, but he expressed confidence in Sanchez's ability to "make all the throws," emphasizing repeatedly that Sanchez's one major area of need is ball security. Indeed. The main thing left out this morning, and still unannounced in Ryan's press conference, is the identity of Sanchez's primary backup, should he struggle to the point of requiring an understudy once more. McElroy did the job last week, but if Tim Tebow has sufficiently recovered from his rib injury, would he step back into that role? Thankfully for Sanchez and the Jets, those decisions will be made in front of a relatively disinterested crowd. After Sanchez got booed off the field last week, the next two games against Jacksonville and Tennessee are on the road, giving Sanchez either the opportunity to get back on track under less direct scrutiny or lose his starter spot with fewer people screaming at him.